Learn how to play basic rock drum beats from drum teacher Jason Gianni in this Howcast drum video. I&apos;m going to cover the standard rock rhythm or the basic rock beat for a drum set. And this is a good place to start if you&apos;re just learning how to play the drums. And basically where you&apos;ll want to start with the surface is that you want to play eighth notes on the hi-hat, which are counted as one and two and three and four and. You&apos;ll play beats one and three of the measure of the bass drum, on one and two and three and four and. And it will sort of a call-and-answer effect with the snare drum, which falls on beats two and four. One and two and three and four and. The hi-hat part will sound something like this. One and two and three and three and four and. Now notice I played accent on my down beats on the one and two and three and four and. This is something that may take some time to develop. So at first if you want just to play straight eighth notes with no accents, that&apos;s an option. That would sound like this. And the bass drum pattern is on beats one and three, and you&apos;re going to use a standard heel-up technique, your heel in the air striking the pedal with the ball portion of your foot and using your entire leg. On one and two and three and four and, one and two and three and four and, one and two and three and four and. So with the correct techniques, the entire rhythm sounds like this. One, two, ready, and. 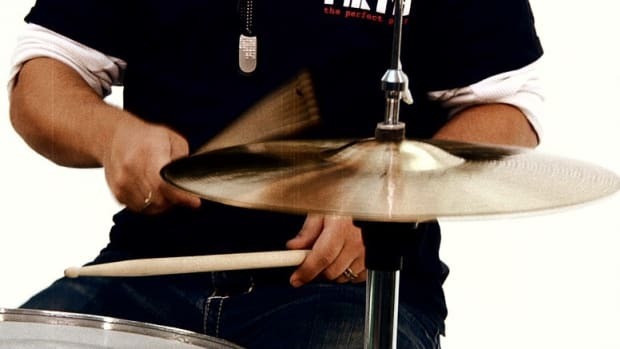 One last thing you may want to try to develop is the same rhythm played off the ride cymbal, where you would move your right hand or your hi-hat hand to the ride and perhaps even play quarter notes or some sort of note value along with the groove that you&apos;re playing. So what I&apos;ll do now is play the same groove off the ride and play quarter notes on one, two, three, four with my hi-hat. One, two, three, four. So although there are many different variations of rock rhythms, and this is just the beginning, this is a great place to start to understand grooving.